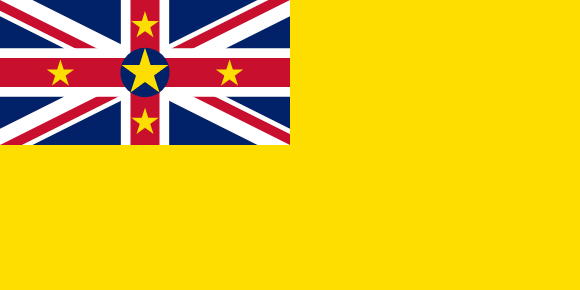 The flag of the Pacific island of Niue is composed of a yellow leaf and a miniature of Union Jack in the upper left corner. Union Jack bears five stars, the largest of which is located in the middle and the other four are placed in the vertical and horizontal stripes. Union Jack points to the fact that Niue is a former British colony. The yellow color of the leaf reportedly indicates warm relations with New Zealand and the four stars represent the Southern Cross constellation which dominates the sky in this part of the world. A big star in the middle of the blue circle symbolizes the independence of the island - currently, Niue is associated territory of New Zealand.